Do you feel stressed out all the time? Do you have trouble relaxing once you get home from work at night? Do you wish there was a way to recharge your battery at the end of a long day? If you answered yes to any of these questions, then you could benefit from installing a hot tub outside of your home. Hot tubs are incredibly therapeutic, and they will allow you to kick back and relax whenever life gets too hectic for you. However, that’s not the only reason to own one. Here are a few more reasons you should consider adding a hot tub to your home. A hot tub will make your backyard look better. Whether you already have a deck and a pool installed in your backyard or you are starting from scratch and looking for a way to make your backyard more attractive, adding a hot tub to the exterior of your home will instantly improve your backyard space. When you pick the proper location for it, it can enhance the entire design of your backyard and make it feel more cozy and comfortable for you and your friends and family. A hot tub will allow you to entertain more often. Speaking of friends and family, everyone will want to come to your house once you have a hot tub installed. There are so many people who enjoy using them, but very few people are able to get access to them on a regular basis. When you have a hot tub, you will be able to invite friends, family, neighbors, and more over to your home for parties and get-togethers. Your social calendar will fill up quickly once you install a hot tub. A hot tub will increase the value of your home. If you ever decide to sell your home, you will, of course, have the option of taking your hot tub with you. Nevertheless, you will also have the option of leaving it behind and letting someone else enjoy it. Many homebuyers will be blown away by how great your hot tub looks in your backyard, and they will be willing to pay a little extra to enjoy the luxuries that come along with having a hot tub. Do you want to start experiencing the benefits of a hot tub for yourself? 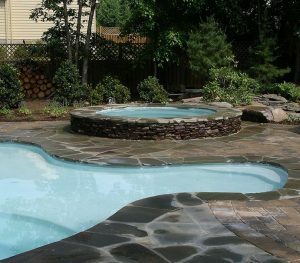 Maryland Pool Builders can help you plan for one and install it for you. Call us at 301-805-0119 today to set up a consultation.